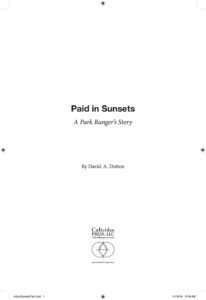 Paid in Sunsets: A Park Ranger’s Story is a humorous memoir of David A. Dutton’s life as a Federal Park Ranger. Park Rangers are called upon to do many dangerous things, like rappel down cliff faces to rescue stranded climbers, or cut fire lines in advance of raging forest infernos. Dutton didn’t do those things. He spent thirty-one years sharing the natural world with others. This memoir retells the best of those experiences—bawdy encounters along the muddy Rio Grande, ghosts in a remote Southwest canyon, swimming with Great White sharks, tweezing pernicious Kentucky ticks off his body, carrying diarrhea out of the longest cave in the world, and getting pissed on by an indignant raccoon in a Mississippi backwater, to name a few. The memoir is about birth, life, and sometimes, death. It’s about a journey—from being a greenhorn Park Ranger in New Mexico to becoming an ordained Senior Park Ranger in Mississippi, twenty years later. 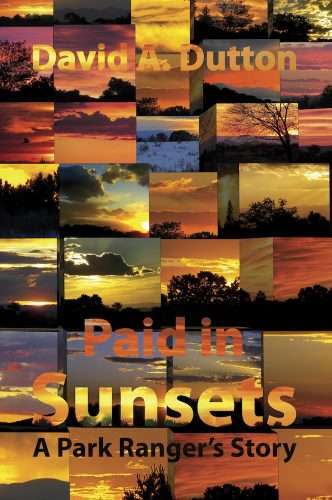 Paid in Sunsets: A Park Ranger’s Story pays homage to rangers as an emblem of ruggedness, individualism, and courage. But more importantly, the memoir shows that Park Rangers are ordinary people, too—men and women who put on uniforms and hats everyday, step into the crowd, and commit themselves to the idea of protecting America’s treasures for the benefit of future generations. For over three decades, David Dutton served as an award-winning Park Ranger for two federal agencies. He enjoys fishing, birding, gardening and red chile. He lives in Santa Fe with his wife and three rescue dogs. If you work for a library or bookstore, use the special order form, or send us an email through our Contact page and ask for a 50% discount off of the retail price. If you are part of a school (K-12) and plan to use the book in a class setting, send us an email and ask for 25% off of the retail price. As an individual you can also order the book directly through us (see below). Alternatively you can purchase hardcover or paperback versions of the book through brick-and-mortar stores or other online outlets. The Kindle version is available directly through Amazon.